The number of Muslim refugees admitted to the United States in the first half of fiscal 2018 has dropped from the previous year more than any other religious group, falling to nearly 1,800 compared with the roughly 22,900 admitted in all of fiscal 2017, according to a Pew Research Center analysis of U.S. State Department data. The low point in Muslim admissions was set in the year after the Sept. 11 terrorist attacks. The reduction in Muslim refugee admissions is part of an overall slowdown in admissions. About 10,500 refugees, including about 6,700 Christians, entered the U.S. from Oct. 1, 2017, to March 31, 2018 – far behind the 39,100 admissions at this point in fiscal 2017 (including 18,500 Muslims and 16,900 Christians). As a result of these changes, Christians account for a far larger share of refugees admitted than Muslims the first half of fiscal 2018 (63% vs. 17%). By comparison, in full fiscal 2017 Christians (47%) and Muslims (43%) were more evenly split, and in fiscal 2016 the Muslim share (46%) slightly exceeded the Christian share (44%). The number of refugees who enter the U.S. in fiscal 2018 is expected to fall below the previous year’s total (53,700) because President Donald Trump’s administration capped admissions at 45,000 this year, the lowest since Congress created the current refugee program in 1980 for those fleeing persecution in their home countries. The slower pace of U.S. refugee admissions in fiscal 2018 is also due to the fact that the current administration restricted admissions for several months as part of a review that resulted in tougher security screening measures. Refugee admissions fully resumed in late January 2018. The lowered cap is one of several changes to the U.S. immigration system pursued by the Trump administration. Some immigration proposals, including those involving refugees, have been challenged in court on grounds that they discriminate against Muslims. In an ongoing case, the Supreme Court has heard arguments on travel restrictions issued by Trump that critics say illegally target some prospective U.S. immigrants, including refugees, from certain countries based on religion. 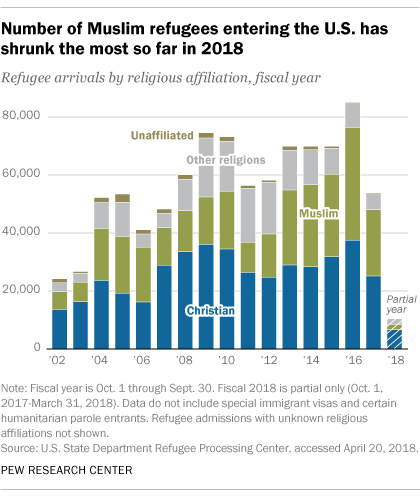 The origins of U.S. refugees in fiscal 2018 align with the shift in religious affiliation. No Muslim-majority countries are represented among the top five nationalities of refugees admitted so far this fiscal year. By contrast, three of the top five origin countries of refugees in fiscal 2017 had Muslim-majority populations – Iraq, Syria and Somalia. U.S. refugee admissions of Muslims stand in contrast to global refugee trends. For each year over the past decade, about two-thirds of refugees living outside of their birth country have come from Muslim-majority countries, according to a Pew Research Center analysis of United Nations High Commissioner for Refugees data. People seeking to enter the U.S. as refugees are processed overseas, where they are asked a series of questions, including their religious affiliation. 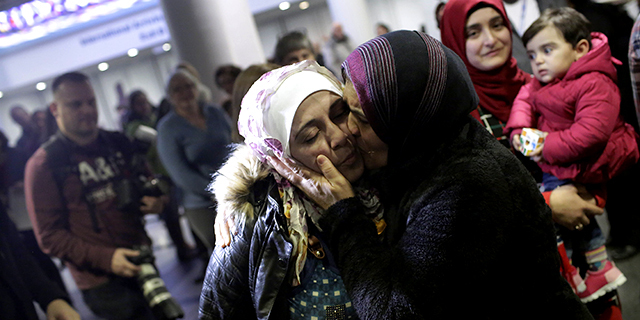 Upon approval of their application, refugees travel to the U.S. for resettlement. In the U.S., refugees are different from asylum seekers, who claim asylum while in the U.S. or at an airport or land border checkpoint.